After two weeks of assessment, Rodolfo Avila has decided to forge an agreement with Christian Jones Motorsport to drive the next eight races of the Asian Formula Three Series - two in Zhuhai, four in Sentul and the final two in Batangas. 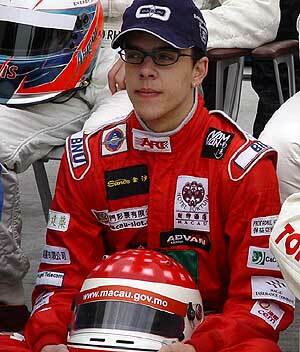 It will be recalled that the young Macanese driver started the season with Fujitsu Ten Toyota Team TOM's (Asia). However, considering the circumstances during the first two events in the Championship, Avila has decided to rescind his contract with team on grounds of poor performance, insufficient team support and the lack of competitive edge from the car.The Australian team (CJM) appeared to be the best option. Christian Jones Motorsport, being one of the top professional teams in the AF3 has also presented guarantees to continue honoring Rodolfo Avila's sponsors - Macau Government, Hotel Fortuna, Macau-Slot.com, 4th East Asian Games 2005, CESL-Asia, Sands Macau, Tong Lei, BNU, CTM, ProFabril Asia Consult, Gain Well Group, San Chong Hong, Fat Siu Lau, RP Macau and PT Asia. "Seeing how they run their team in the first 2 rounds, we have observed that they really know their stuff. Additionally, with support from Neil Brown Engineering, I can expect to have a competitive Mügen Honda engine", remarked Avila. Asked about how he feels that Christian is both team owner and driver, Avila added "It doesn't bother me to have Christian driving the other car in the team. My car will be prepared equally and the team understands that it will be beneficial to have both cars on the top positions".Avila is expected to drive a Dallara F301-Mügen Honda and despite the 301 being an older car (to Jones' 304), Avila believes the advantage of a lighter car may do the trick. The biggest adjustment would have to be getting accustomed to an H-pattern gearbox. "The apprenticeship with the gearbox should not be too demanding. I just need to do some miles and I should be ready. Several years ago I drove a Formula Campus and I didn't have too much trouble getting used to it. Generally, I feel optimistic about this move and I look forward to a much improved level of competition from myself and my new team", concluded the Asian FRenault champion.CJM was formed in August 2002 and entered the Australian Formula 3 Championship a following year with Christian finishing 4th at the team's first attempt. In 2004, CJM moved to the Philippines and ran a two-car team in the Asian Formula 3 Championship where Christian won the Asian Formula 3 Championship title. Currently, the team is also responsible for the selection of Australia's entry into the A1 Grand Prix. Round 5&6 of the Asian Formula 3 Championship is scheduled on June 17-18 at the Zhuhai International Circuit, In China where Rodolfo is expected to arrive early to acclimatize himself with the new car and team.